With an annual income of more than 2.5 billion VND (111,200 USD), a farmer in the northern province of Quang Ninh has fellow farmers queuing up to learn his new techniques in agriculture production. For years, Pham Van Tan, 53, Cam Pha City's Mong Duong ward, has taught other households to apply technology to boost production and therefore improve their living conditions. He had to use his family's savings and take a 30 million VND (1,335 USD) bank loan for his business. 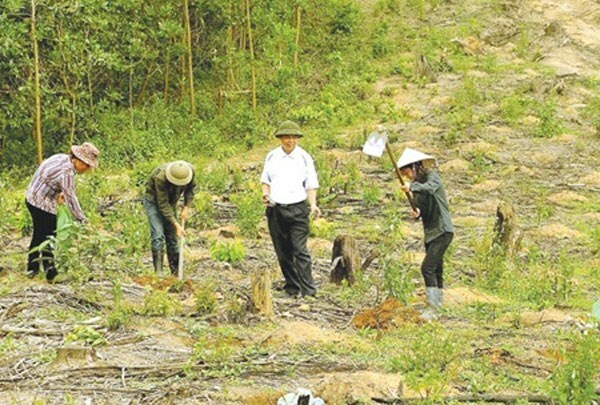 But with determination and the encouragement of local authorities, he visited places where he could learn planting techniques such as in Lang Son, Yen Bai. He even travelled to China to learn. Then in 2003, acacia became in demand. It is used in coal mining and as material for paper and plywood. He earned about 50 million VND (2,225 USD) per ha. Thanks to this he earned about 200 million VND (8,900 USD), a fourfold increase compared to normal planting. Inspired by Tan's success, his fellow farmers decided to follow him and listened to his advice. As a result, many have escaped poverty. Apart from guiding other households on how to grow trees in an appropriate manner and how to breed shrimp, he created jobs for 30 labourers with an average income of 4 million VND (178 USD) per person per month.